27 Unfamiliar Beaches Will Leave You Amazed! For most people, beaches are cool tourist destinations for spending free time and to forget about life in crowded cities for the day. But then there are these amazing unusual beaches. Visiting these unusual beaches will not only give you calm and peace, but they will make you feel like you’re in different world! When you are in a singing beach, a glowing beach, a beach with rainbow-colored sand, of course, you are in a different world. Here are the most wired beaches you’ll find on Earth. They are distinctive, not because of they’re still a way from most people to reach but because of their strange and amazing singularity. Whitehaven Beach, which is located in Whitsunday Island, Australia. The sands on this beach are radiant white and consist of silica. This allows people to walk barefoot even on hot sunny days without feeling like their feet are getting really hot. Hyams Beach is located in New South Wales, Australia and is encircled by three radiantly white sand seashores. This amazing beach was mentioned in the Guinness Book of Records as having the beaches with the whitest sand in the world. 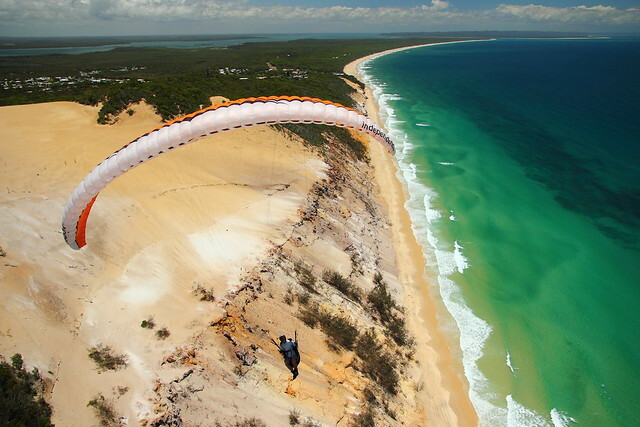 People in Australia recommend it for visitors as well as themselves! If you’re in Canberra, it’s about a 3 hour drive from your place to reach the beach, but it’s really worth it! Iriomote Island, where this beach is located, is a small island in Okinawa, Japan. Visitors are normally seen crouched over the sand, examining the curiously-shaped particles on their hands. Most of the beach is covered of exoskeletons of foraminiferans. Foraminiferans are type of zooplankton, microscopic marine organisms, which believed to be fossil evidence dating back 550 million years ago. If you look closely, you might find some that are still living. When basalt lava flows into the water it cools very fast, making the black sand found on this beach. This odd beach is located in Hawaii. In the Marieta Islands, about 20 nautical miles from Puerto Vallarta, Mexico, lies a peaceful beach paradise hidden underneath a hole in the ground. It was created when the Mexican government, in the early 1900′s, made a bomb site in preparation for the First World War blowing up a very big hole in the canopy of the grotto. The beach is still unsullied due to the difficulty of getting to it and despite its story, we’re actually thankful – it’s marvelous beach! They say: more than 74 different colors of sand are coloring this beach, just like a rainbow! The colors came as a result of years of erosion and iron oxidation dating back to the Ice Age. This amazing beach is located in South-eastern Queensland, Australia. They call this beach “Dragon Eggs” or Moreaki Boulders beach because of the unique rock formations it has. The water has been washing away rocks for years but for these heavy spectacular rocks, the water has only helped shape them. This beach’s location is adjacent to the Princess Juliana International Airport in Saint Martin, it’s almost easy enough to jump up and touch a flying airplane! Most people visit it in order to feel the extreme turbulence and power caused by the airplanes. The name of this beach comes from the spherical rocks scattered across the shore, in Schooner Gulch, Mendocino County, California, USA. The rocks have formed by years of erosion. Before you start wondering about the name, it’s not about music! The frictions between the grains of sand in this beach are actually more of a creaky, squeaky kind than a melodic kind. But this is why it’s called “Singing Beach”. It’s located in Manchester-by-the-Sea, Massachusetts, USA and considered as one of the most popular beaches in the world. Shell Beach is in L’Haridon Bight, Shark Bay, Western Australia and is considered to be one of the only two beaches made entirely out of shells. The water here has high salinity. That’s why numerous cockles grow quickly along 7 to 10 meter of seashore with no appearance of its natural predators because they don’t have the ability to live in such conditions. Here it’s not sand, it’s all grass! This unique beach located in Kourou, French Guiana. This beach created by nature itself, is located in Playa de las cathedral’s/Praia de Augas Santas, Ribadeo, Spain. The water ceaselessly pounds against the large rocks making a cathedral-like effect. It is only accessible during low tide. Due to its gathered phytoplankton (microscopic plants that are part of sea plankton), you will feel like you’re watching an ocean of stars when at this beach! It’s located in Maldives. The following image took by Taiwanese photographer Will Ho. It’s located in Big Sur, California, USA. The purple color of its sand comes from its dominant mineral quartz combined with manganese garnet deposits found in the surrounding rocks, which makes it a very attractive tourist destination. In East coast of the Coromandel Peninsula, New Zealand, you can make your own DIY personal spa! But you need to check out the website to know more about this geothermal beach and the heat that comes with it. This beach is located in Playa De Gulpiyuri, Llanes, Spain. It’s small but it linked to underground waterways that leads to the Atlantic. Perfect for a private picnic. Through years of wave movement, a white rock of random stairs created itself naturally in southern Sicily, Realmonte, Italy. Visitors have to pass through a long creepy tunnel to get to this beach in Dunedin, New Zealand. It includes pretty sandstone cliffs, rock arches, caves, and other stunning rock formations against the backdrop of the impressive Pacific Ocean. The bright green sand is created by the mineral olivine. This beach, called “Papakolea Beach”, or “Mahana Beach” is located in South Point, Ka’u, Hawaii and is one of 4 other beaches in the world with bright green sand. Another black sand beach, this beach is one of the ten most beautiful non-tropical beaches on Earth, according to American journal Islands Magazine in 1991. In fact, most of the beaches in Iceland are covered with black sand due to the nearby volcanoes. Wild pigs can be seen lounging about and swimming in the clear waters around the big major cay island in the Bahamas. How many pigs are around and where they came from is unknown, but it adds something interesting for visitors. This beach located in Ireland is the result of an old volcanic eruption. You can tell by the pictures why this beach is so unique and beautiful. This beach is covered with smooth limestone rocks that nicely massage one’s feet while walking. This beach is located in Washington Island, Wisconsin, USA. It’s just like a place for hiding! This amazing cave-like beach is located in Algarve, Portugal. You may find that the rocks in this beach are similar to the ones in Schoolhouse Beach. This beach is also covered with a large number of smooth round pebbles instead of sand. The waves gathered the smooth rocks in from the sea. The Glass Beach in Hanapepe, Kauai, Hawaii, is covered with millions of very small fragments of glass which came from years of discarded glass washed up on shore. There are other beaches like this one, like Fort Bragg and Benicia, which are both in California.